Ruby Legends Elisabeth Ranson, Kerry McLeish and Rachel Paris. 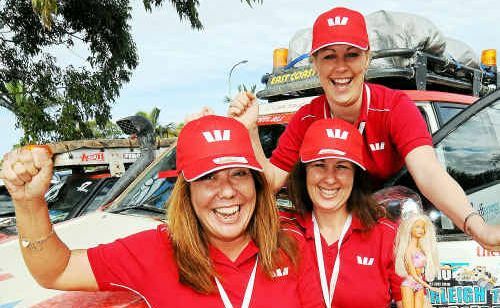 THE Great Endeavour Rally crossed the finish line yesterday as it ended its 10-day trip in Bargara, but not before raising $330,000 for the Endeavour Foundation. Car rally road boss Jamie Lawson said the 80 entrants’ enthusiasm and fundraising skills were amazing. The event, which always goes to different locations, stuck to this year’s theme of locations, bush, beach and bays. 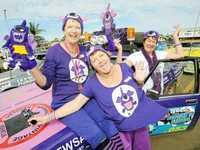 “We started in Burleigh Heads and have done 3000 kilometres in 10 days,” Mr Lawson said. 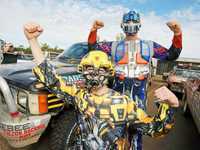 The rally was to raise money for the Endeavour Foundation, which supports intellectually disabled people. Mr Lawson said it was not unusual during the course of the rally for people to be on the roadside changing gearboxes, starter motors and shock absorbers. “It’s amazing the comradeship,” he said. 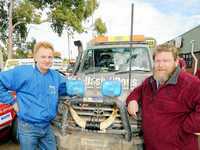 Kevin Blackman and his step-daughter Stacey Maltby rolled a 1983 Landcruiser after losing traction on gravel. Mr Blackman said that by the time the duo got out of the harnesses and out the windows people were there to help them. “They made us sit down and they flipped the Landcruiser on to its wheels and changed a couple of blown tyres,” he said. He said the leaf spring had also broken on the car. 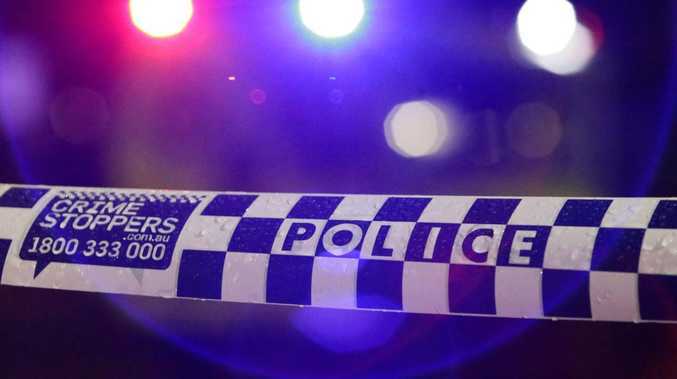 “We got into the next town two hours later and 20 minutes after that a new spring turned up,” he said. People can still donate online at www.greatendeavour.com.au.